I had a wonderful dinner at the Kurhaus Restaurant which features regional cuisine during my stay at the hotel in March 2008. Chef Steffen Duckhorn provided a fabulous introduction to the local products through his carefully selected tasting menus. After dinner, I had the opportunity to sit down and meet with Chef Duckhorn who joined the Grand Hotel Heiligendamm when it opened in 2003. 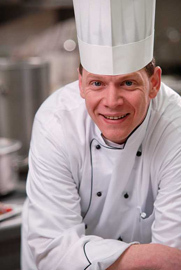 In January 2008, he was promoted to the position of Executive Chef of all the kitchens. He came to the Grand Hotel Heiligendamm after honing his career with an apprenticeship in Frankfurt am Main, and worked on a cruise ship seeing all parts of the world before returning to Germany where he worked in Berlin at the Hotel Adlon Kempinski and at the Kempinski Bristol Hotel. When I asked him where his favorite place in the world is, he replied "At home with my family." Chef Duckhorn and his wife have three daughters, a 4-year old and 1-year old twins. Chef Duckhorn likes German regional cuisine and also enjoys catering and banqueting, and said that the G8 Summit (held in 2007) was a wonderful event for him to showcase German regional cuisine. The hotel has herb gardens; there is fresh salmon from the Baltic Sea, delectable cheeses from the region, and a host of other specialty products making the region a culinary paradise. When not working in the kitchen or spending time with his family, he enjoys riding his Honda CVR 600 motorcycle and listening to loud heavy metal music of Metallica, Man of War, and Panterra. His dream? Someday owning a custom Harley-Davidson motorcycle. He graciously shares his recipes for a tempting three-course menu to provide a delicious taste of the Kurhaus Restaurant. Method: Wash and peel the celeriac, and chop into walnut size pieces. Heat a pan with oil and then add the shallots followed by the port wine and simmer. Then add the poultry stock, and finish with the whipping cream. Cook the celeriac until tender. Add the cold butter and puree in a kitchen mixer. Adjust seasoning to taste. Method: Cut the deer meat into 4 portions of equal size. Wash the cabbage and cut the leaves to equal sizes. Add the chopped shallots and bacon or pork fat and cook; add white wine and beef broth and simmer. Add the salt, pepper, and a little juniper. Dice the old rolls, and add the chopped walnuts. Mix the eggs with warm milk and pour over the rolls and walnuts. Add enough milk to make a dumpling. Add the nutmeg, salt, and pepper, and mix well. Boil the dumplings in water. Bake the venison with the herbs (rosemary and juniper) for 15 minutes in a 180° C (350° F) oven. Remove the vension from the overn, and make a crust with the butter, breadcrumbs and rosemary and place on top of the venison. Return to the oven and bake for 4-5 minutes. Arrange nicely on a plate with some sauce, dumplings, and cabbage. Method: Make a batter of flour, sugar, coconut flakes and white wine. Peel the bananas, remove the core, and cut into pieces. Add the pineapple to the batter and deep fry until golden brown. Arrange on a plate and serve with a ball of the passion fruit ice cream and freshly grated coconut.